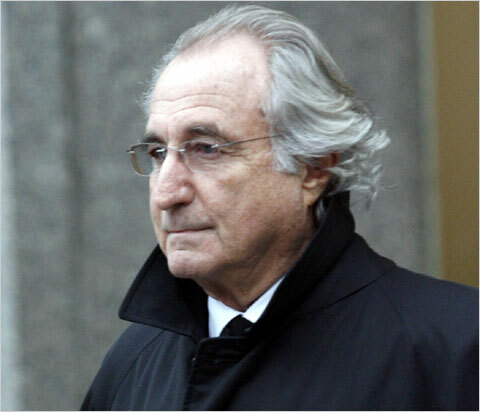 Bernie Madoff plead guilty, "sorry" and "ashamed" this morning to defrauding hundreds of clients and running a $50-billion Ponzi scheme. Here is the video that ran on Al-Jazeera television. We posted it because everything sounds better when reported in a British accent. Sentencing has been set for June 16. See the full 11 felony charges to which he plead guilty to and the time in jail each, after the jump. Count 1: Securities fraud. Maximum penalty: 20 years in prison; fine of the greatest of $5 million or twice the gross gain or loss from the offense; restitution. Count 2: Investment adviser fraud. Maximum penalty: Five years in prison, fine and restitution. Count 3: Mail fraud. Maximum penalty: 20 years in prison, fine and restitution. Count 4: Wire fraud. Maximum penalty: 20 years in prison, fine and restitution. Count 5: International money laundering, related to transfer of funds between New York-based brokerage operation and London trading desk. Maximum penalty: 20 years in prison, fine and restitution. Count 6: International money laundering. Maximum penalty: 20 years in prison, fine and restitution. Count 7: Money laundering. Maximum penalty: 10 years in prison, fine and restitution. Count 8: False statements. Maximum penalty: Five years in prison, fine and restitution. Count 9: Perjury. Maximum penalty: Five years in prison, fine and restitution. Count 10: Making a false filing with the Securities and Exchange Commission. Maximum Penalty: 20 years in prison, fine and restitution. Count 11: Theft from an employee benefit plan, for failing to invest pension fund assets on behalf of about 35 labor union pension plans. Maximum penalty: Five years in prison, fine and restitution.